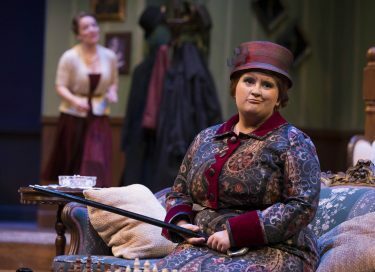 When Mrs. Boyle clomps onto the stage in the first scene of “The Mousetrap,” many elements combine to assist the Ethington Theatre audience in making a judgment about her. Mrs. Boyle (played by Madison Kesterson) immediately broadcasts that she is a bossy woman of means who is accustomed to the mantle of authority and to getting her own way. And while her bearing, tone of voice and mannerisms go a long way toward defining her, it is also the fabric and style of her dress, the nature of her shoes and the quality of her hat and overcoat — her costume — that help finish the picture. The authenticity of the wardrobe worn by all eight characters in “The Mousetrap” — its final performances are scheduled for 7:30 p.m. Friday and Saturday at 2 p.m. Sunday — are the direct result of the research, skill and efforts of Nola Yergen, College of Fine Arts and Production costume designer. That meant she needed tweeds, wools and thicker garments, some of which were procured from vintage shops, she said. For Mrs. Boyle, Yergen and assistant costume designer Sarah Levinson loosely gave her the look of Madam Undersecretary Professor Dolores Umbridge, a character from the beloved Harry Potter book series. Though the conservative cut and soft woolen fabrics of their costumes are similar, Umbridge often wore pink while Mrs. Boyle is garbed in darker colors. Yergen and Levinson also sought to have clothing reflect societal standing. For example, the coat worn by Giles Ralston (played by Ben Tietz), Monkswell Manor innkeeper and newlywed, is a bit rough, more of an indoor-outdoor jacket that reveals that he is somewhat working class. His wife, Mollie (played by Stacy Smith), on the other hand, dons pearls and high heels, an indication of her somewhat higher class and her having inherited the former monastery from her aunt, Yergen said. A key component was to fulfill the vision of director Michael Kary, and another was to adhere to the dictates of the script. One of the many twists in this colorful murder mystery is that several characters come clad in the same outfit worn by a man seen leaving the scene of a London murder: an overcoat, felt hat and light-color scarf. “The whole goal is to make you suspect all of them at one point or another and have reasons why you discount them,” Yergen said. Yergen spoke Thursday from her costume workshop and office on the second floor of Building 18, a colorful, wondrous place stuffed with racks of clothing and tables covered with costumes in progress. 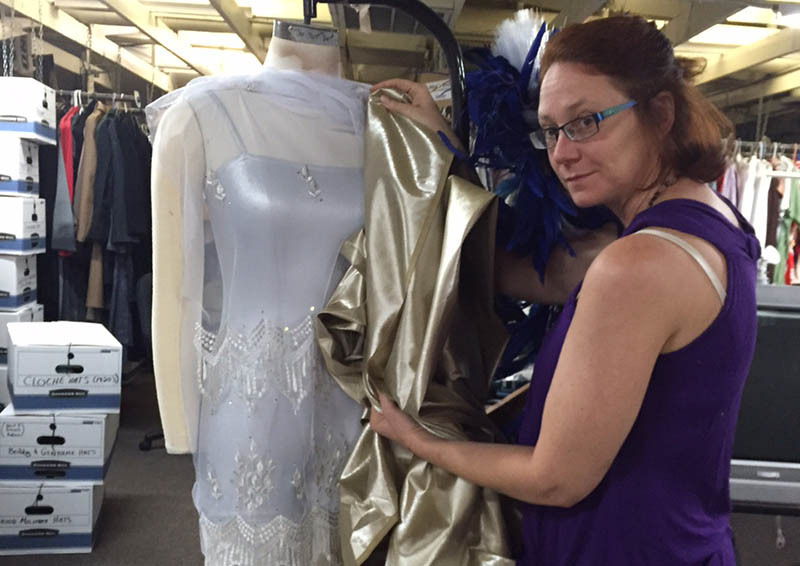 “We probably make more clothes than any other theater in the Valley,” Yergen said. 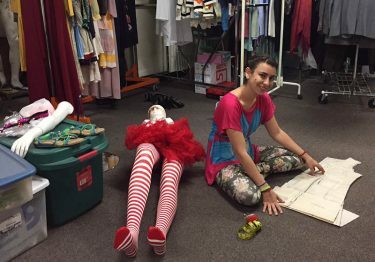 Yergin, Levinson and student volunteers Kara Newman and Chelsie Correll were busy working on costumes for “Of Thee I Sing,” a musical and political satire that opens Oct. 14 at Ethington Theatre and has a cast of 50. “It’s the largest costume show we’ve ever done, with 150 costumes,” Yergen said. ● Tickets for The Mousetrap are still available and can be purchased here. For a story about the play in GCU Today, click here. For a slideshow, click here.